Accidents are bound to happen when playing a sport on ice, especially ones that are bad enough to lead to hockey players getting injured. Hockey is known for being one of the most physically demanding sports that takes extra concentration to not slip and fall on the ice. Though, when these slip-ups do happen, they can take a higher toll on the players’ bodies, no matter the seriousness of the fall. Including possible collisions with other players, occasional hitting with the hockey sticks or even the pucks, getting hurt while on the ice is something all players eventually go through. Though sometimes, its common for players to have moments where that fell random pains for no reasons. These are the isolated cases of unusual knee pains, lower back issues, or even uncomfortable groin strains. Eventually, athletes are going to have to miss a few games if these minor issues are taken care of properly, especially considering that these minor issues can turn into major ones if left untreated. Instead of waiting for these little pains to become major ones that requires even more work, lets change the mindset and start handling issues before they grow out of hand. 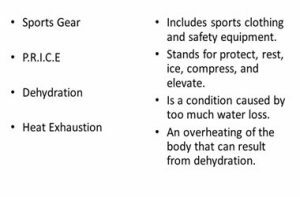 Listed below are five ways to help your players prevent injuries that will keep them from missing games. Flexibility is commonly overlooked when it comes to sports, such as hockey. Though, having increased flexibility will help players significantly decrease the risk of pulling or straining muscles during practices or actual games. Plus, when a player muscle is tight during demanding activities, such as making slap shots or bigger skating strides, when they have tight muscles they’re constantly putting their muscles at risk and could eventually lead to tears. To help with this issue, start off each training session with a stretch routine that will help your players build more flexibility. Mobility, the players ability to move around with ease, can lead to players developing issues as they play. Players who lack having high mobility are limiting themselves and their ability to move quickly while on the ice. One of the main reasons why players cannot seem to move quickly or have an incredible first glide is due to mobility-related issues. The best way to solve this problem is to have players do mobility exercise for their upper and lower body before they get on the ice. Eventually, you and the players will start seeing positive results. While hockey may be an enjoyable sport, you and your players should keep in mind that our bodies were not naturally built to put on skates and wear them for extended periods of time. Once players do ear skates, its putting more strain on the muscles needed to properly skate while other stability muscles get ignored. To avoid these muscles from getting weak or overused, players should be getting weekly, preferably bi-weekly massages so those overused muscles can remain loose. Another solution is to incorporate A.R.T, also known as Active Release Technique, which involves releasing extra stress from trigger points and pressure points. Many hockey players are at a higher risk for injuries if they lack adequate strength needed to protect them from the higher impact falls and collisions. Every part of the hockey player’s body – tendons, muscles, and bones, must be strong to prevent the frequency of serious injuries, such as broken collarbones and ripped tendons. The best way to prepare your players is to start getting them into the gym and having them perform repetitions of weighted squats, pull-ups, and planks to increase their core strength and overall body strength. The last tip to offer is to follow all the previously mentioned tips, along with making sure that the hockey players muscles stay balanced. Its easy for any sports player to develop muscle imbalances that will increase their likelihood of getting injured. The best way to handle this issue is to push your players to workout every part of their body instead of focusing on one part. When hockey season is over with, players should still be finding ways to stay active. If the players incorporate the previously mentioned tips into their daily lives, in and outside of the ice rink, it will greatly decrease the chances of them getting hurt seriously, or even complaining of having minor issues.